¿What’s Bueno? ¡Las Vegas Edition! Now this brings up an interesting (to me) issue — one that I’d been meaning to share with you, the reader, for quite some time, so that you, too (the reader), will find it interesting. …and I’ll find delicious, high-quality, name brand wieners — delicious, high-quality, name brand wieners that I don’t find at other locations. …that I wouldn’t look twice at in a grocery store, but since I assume it goes for like ten bucks there, I feel compelled to pick it up here for 99¢ only just because it’s a good deal. Update: I did a little research (which is what I do here for you, what, six readers), and it turns out they sell for an astronomical $2.00 at Walmart. That’s more than double 99¢ Only’s low, low price. Let me break it down for you: By purchasing this at 99¢ Only I saved a whopping 99¢ only plus another two cents. And for the record, I still assume they go for more at one of your so-called “super” markets, so even though it’s sat in my freezer for the last month and I have little interest in eating it, experts will tell you: buying this was a shrewd move on my part. …by the God-blessed palletful! Oh yes. And there were two displays of them, each piled high as you please! As big as a man, they were! A large square man, it would seem. Let me tell you — in your wildest dreams you cannot imagine the marvelous surprises that await you at the Van Nuys store. So do me a favor, pal, and stay away — I kind of like to be the only one of us who finds the neat-o deals. You understand. 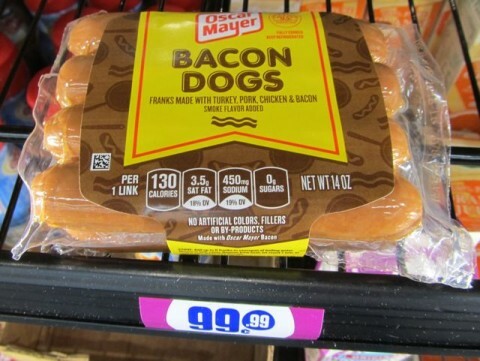 Anyway, the point is, you go to different 99¢ Only stores, you’re going to find different products, sometimes! So I had high hopes for the Las Vegas location I visited. High hopes indeed! And that was about it. Bleah. Oh, this Nevada 99¢ Only had all the usual stuff that all their Southern California brothers carried, but aside from these boxes of unsold-store-stock-from-last-October Limited Edition Pebbles cereal, there was nothing I saw that was unique to this location. We’ve talked about the Pebbles family of cereals before, haven’t we? Ah yes, here and here. And what I find fascinating, and now you do, too, is that without the adjectives “Cocoa” or “Fruity” in front of it, “Pebbles” — which on the original two varieties described the size and shape of the cereal itself — now seems to specifically reference the Flintstones’ baby girl, featured prominently on the box, much like Dora is on Dora the Explorer cereal, or Spongebob on Spongebob Squarepants cereal. But unlike Dora or Spongebob, no one under the age of thirty has any idea who the hell Pebbles Flintstone is. That’s kind of interesting, right? Sure. Okay, that should even things out, right? 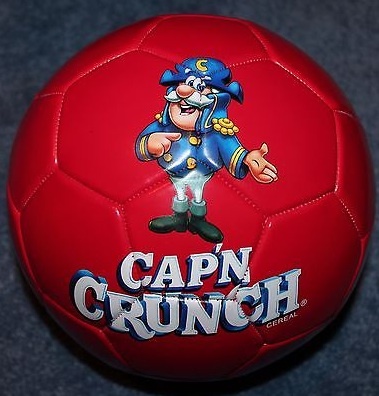 Fascinatingly, not only does it depict the Captain as he’d look after numerous redesigns forty years in the future, it was also shipped in the boxes fully inflated, which tended to crush the cereal into powder (which somehow still cut the roof of your mouth!) 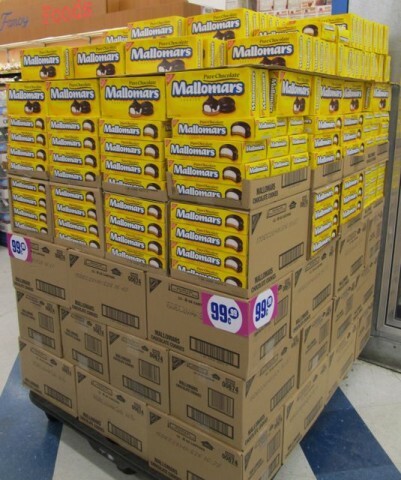 and made the boxes bloated, misshapen, distended…and impossible to keep from rolling off the shelves. Thus they were only in the stores for a few days before they were recalled, making this perhaps the rarest of Cap’n Crunch IBPs. (In-Box Prizes. Industry term.) Still, as prizes go, it’s one of my favorites. My point is, you want my seal of approval on your cereal, you better give me a decent prize. 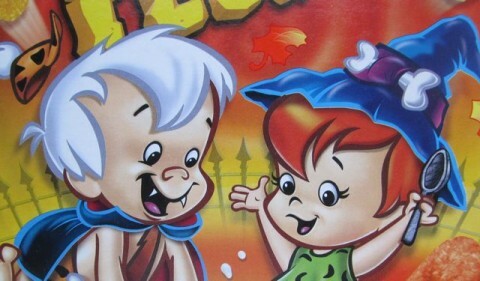 • Pebbles and Bamm-Bamm dressed as a Wiccan and a vampire? 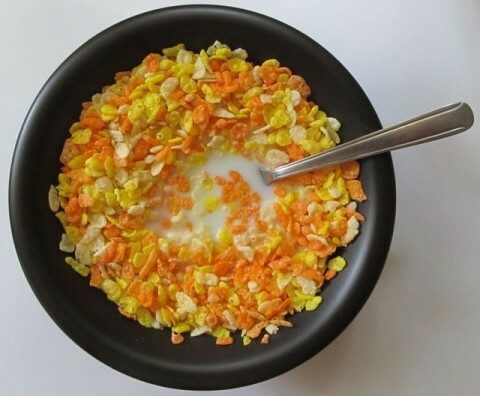 The whole concept behind the cereal doesn’t make any sense! We’re supposed to believe these characters lived thousands of years ago, in the stone age, and somehow they’re celebrating Halloween, i.e, the birth of Christ, millennia before Jesus himself went trick-or-treating in Nazareth (but only at the homes of people who left their porch lights on and didn’t mark their doors with lambs’ blood, if I recall my Sunday School lessons correctly). 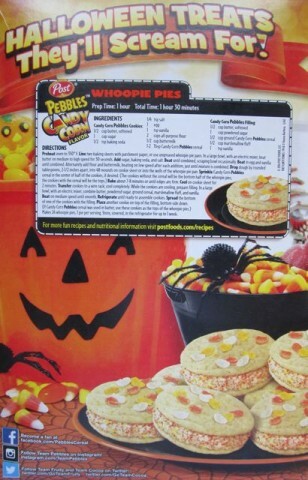 • The back of the box features a photo of Halloween snacks and a recipe. What’s going on here? I’m expecting some delightfully garish and off-model illustrations of the gang from Bedrock challenging me to, I dunno, probably a maze constructed by palm trees, boulders and brontosaurus necks — and instead I’ve got an overly complicated 14-ingredient, 13-step set of directions to make something called “Whoopie Pies” (which by the way no one ever heard of two years ago but is now one of those trendy foods that’s all over your precious “Pinterest.”). 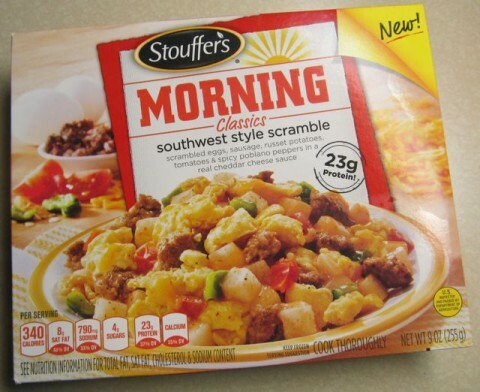 Bottom line, the only way this stuff is bueno is if, 30 years from now, I unpack the carefully preserved package from my stockpile of old cereal boxes and list it on whatever eBay-like auction site exists then and sell it for a ton of cash. 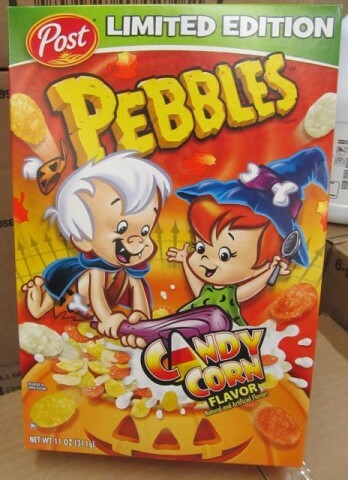 And for that to happen, I need for everyone else who saved their Halloween Pebbles boxes for eventual re-sale as collectibles to perish in some sort of cataclysmic event that fortuitously spares everyone who collects old food packaging but needs this particular box. Could happen. In fact, my entire retirement plan counts on it. Anyway, while 99¢ Only in Las Vegas didn’t hold a lot of wonderful surprises for me, at least they had 7-pound bags of ice for 99¢ Only, and that’s the main reason I went there. I make it a point to fill up my hotel room bathtub with ice before I go out irresponsibly gambling and binge-drinking. That way, whoever steals my kidney isn’t relying on hotel-provided ice. I learned that the hard way a few years ago when I woke up in a shallow tub of lukewarm water with a Post-It note on my forehead apologizing that the ice machine at the end of the hall was out of order. I’d tell you the whole story but I’ve got to go. I just had a sip of iced tea and now I have to tinkle like a race horse. 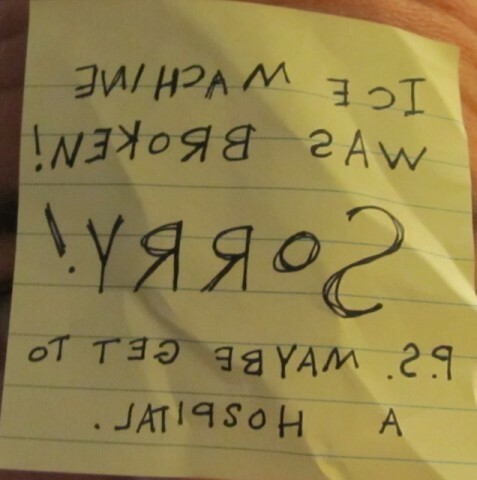 Posted by Ted on April 27, 2015, 1:42 PM.